Photograph of Mary Suzanne Chadwick, Margaret Spencer and six other unidentified students. 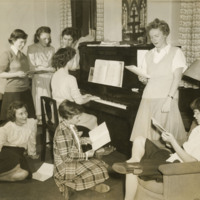 One is playing a piano while others are huddled around her (some standing, some seated) and reading notation (while perhaps singing). The photo is identified as being from page 46 of the 1944 yearbook. 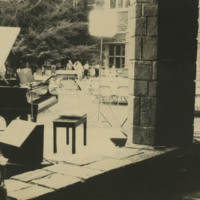 Photograph of a piano and bench with reunion attendees in the distant background.